CO2Gen produces pure CO2 directly from the atmosphere. CO2Gen – A product that produces pure CO2directly from the atmosphere. There is a known market for CO2 for industrial, commercial and domestic uses. Existing supply chains are limited by their point sources of CO2, by their large and expensive fixed infrastructure, by long transport distances to end users and by entrenched supply chains, which creates monopoly-like terms of supply for customers. A key market segment, dry ice, suffers from significant sublimation losses due to delays between production and use. We are developing a direct air capture (DAC) product (CO2Gen) that can capture CO2 from ambient air and convert it to pure CO2 (a CO2 Generator), integrated with a commercially-available liquefier and dry ice pelletiser to provide dry ice on-demand. It is compact, less expensive and can be located much closer to end users, thereby allowing disruptive supply opportunities and better customer value. The CO2Gen uses novel Metal-Organic Framework (MOF) adsorbents as the core technology to enable the device. 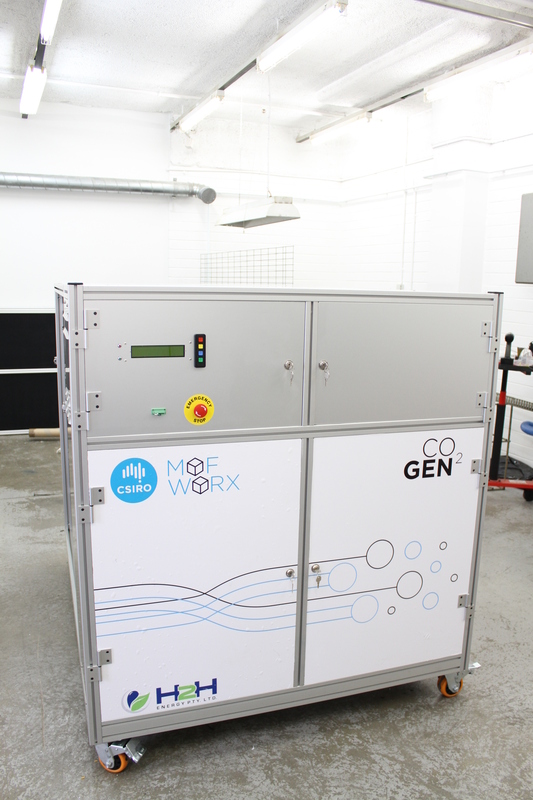 The CO2Gen has been developed to prototype stage and has demonstrated proof of concept for the application. Discussions with prospective customers have confirmed their interest in the product.